Child Dental Benefits Schedule and will provide benefits for basic dental services to around 3.4 million children aged 2-17 years. From the 1st of January 2014, the Australian Government will introduce a new dental scheme called Child Dental Benefits Schedule and will provide benefits for basic dental services to around 3.4 million children aged 2-17 years. This new scheme will replace the existing Medicare Teen Dental Plan (MTDP) with an expanded program that increases the eligibility age range, benefit amount and the services that can be provided. The total benefit entitlement will be capped at $1,000 per child over a two calendar year period. Grow Up Smiling (GUS) will have the same means test as the Medicare Teen Dental Plan, which requires receipt of Family Tax Benefit Part A (FTB-A) or certain other government payments. The schedule of dental services for Grow Up Smiling will consist of services for essential dental treatment, such as check-ups, x-rays, fillings and extractions. High end (crowns, bridges, root canal) and orthodontic items are excluded. As the payment of benefits will be administered through Medicare, using details held by Centrelink or the Department of Veterans’ Affairs, you should ensure that your details are up to date. The Child Dental Benefits Schedule (Previously known as Grow Up Smiling), a new dental program for eligible 2-17 year olds that will provide up to $1,000 in benefits to the patient for basic dental services. The Child Dental Benefits Schedule will replace the Medicare Teen Dental Plan on 1 January 2014 and will be administered by the Australian Government Department of Human Services. Who can provide a service to an eligible Child Dental Benefits Schedule patient? A patient can receive benefits under the Child Dental Benefits Schedule for services performed in a public or private clinic. In order to provide services under the Child Dental Benefits Schedule, a dental provider must hold general or specialist registration with the Dental Board of Australia. The services may only be billed by a dentist or dental specialist (either a private provider or a representative public dentist) who has a Medicare provider number. As with the Medicare Teen Dental Plan, services or part of a service may also be provided on behalf of a dentist or dental specialist by another dental practitioner. Dental practitioners able to provide services on behalf of a dentist or specialist include dental hygienists, dental therapists, oral health therapists and dental prostheses. Smile Place?Dental can provide services under the Child Dental Benefits Schedule. What makes a patient eligible for the Child Dental Benefits Schedule and how long does eligibility last? is eligible for Medicare and receives or is part of a family receiving a relevant Australian government payment such as Family Tax Benefit Part A. A patient?s eligibility lasts a whole calendar year and is reassessed from the beginning of each calendar year. Total benefits are capped at $1,000 per patient over two consecutive calendar years. A patient?s benefit cap can only be used for eligible services provided to that patient: family members cannot share their entitlements. A patient?s entire benefit cap can be used in the first year if needed. If the entire cap is not used in the first year, the balance can be used in the next year if the child is still eligible. Any balance remaining at the end of the two year period cannot be used to fund services that are provided outside that two year period. Eligible children or their parents/guardian will be sent a notification letter from early 2014 notifying them of eligibility for the Child Dental Benefits Schedule. The notification is not a voucher for services. Dentists should confirm the child?s eligibility before providing services, and remaining balance at each occasion of treatment. Claims for services provided to patients that are not eligible or who do not have any remaining cap balance, will not be paid. How can I check a child?s eligibility and remaining balance? You can also phone 132 150 (call charges may apply ? calls from mobile phones may be charged at a higher rate) 24 hours a day 7 days a week. You will need the patient?s Medicare card details to access this service. Which services receive benefits under the Child Dental Benefits Schedule? A dental check-up will usually include an examination where the Dentist will assess your teeth, gums and appearance of your smile, scale and clean, fluoride treatment and x-rays (if required). e examinations, x-rays, cleaning, fissure sealing, fillings, root canals, extractions and partial dentures. Many of these services have claiming restrictions. A professional clean, also known as a scale and clean, is designed to remove plaque and tartar that is unable to be removed with normal everyday brushing at home. A fissure sealant is a tooth coloured sealer ?which is applied in the grooves on the chewing surface of adult molar teeth to prevent cavities from forming in early years. A filling is a material that is placed into a tooth to replace missing tooth substance and/or structure which can be caused by tooth decay, cracked or broken teeth or teeth that are worn from unusual use such as nail biting, teeth grinding or using teeth to open things. They are usually tooth coloured. Root Canal Treatment is a dental procedure that removes the nerve or dental pulp of the tooth. This is often required when the nerve of a tooth has been damaged by trauma or, more commonly, tooth decay. ?Often Root Canal Therapy is the alternative to tooth extraction and often required to retain/save a damaged tooth. Extractions, or tooth removals, are performed for a wide variety of reasons, including decay that has destroyed enough tooth structure beyond being able to be restored. 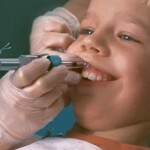 Orthodontic treatment occasionally involves the need for extractions. The schedule of services that are included in the Child Dental Benefits Schedule and the benefit payable for each service are available from humanservices.gov.au/healthprofessionals > Other health care providers > Dentists. Only those items listed in the schedule can be claimed under this scheme. Any additional services not covered by the Child Dental Benefits Schedule must be paid for by the patient. It is strongly recommended that you read the Guide to the Child Dental Benefits Schedule thoroughly so that you understand the scope of services and any restrictions that apply before providing services to patients under the scheme. A guide explaining program requirements and the list of eligible services, benefits and restrictions for each service, is available from the website below. Will a quote need to be provided before services are provided? Yes. It is a requirement that the responsible child or her or his parent/guardian consents to the treatment and associated costs before any services are provided under the Child Dental Benefits Schedule, including examinations and emergency treatment. Your advice on treatment and associated costs and the patient?s or parent/guardian?s consent can be provided verbally, before treatment proceeds. If further treatment need is identified as a visit progresses, consent to any further treatment and costs must be sought at relevant points prior to the provision of those services. Consent to all services and costs must be documented in writing before the end of the visit. For privately billed services, the patient or parent/guardian will need to document their consent by signing the relevant patient consent form at each visit. The paperwork must be completed on the day of the visit, but can take place after the provision of treatment, such as when the patient settles the bill. For bulk billed services, the relevant patient consent form is only required on the first visit in each calendar year. What are the record keeping requirements for the Child Dental Benefits Schedule? It is a requirement that dental providers must maintain adequate and up to date records for four years that clearly indicate that the claimed service was provided. To assist you, forms will be available at: humanservices.gov.au/healthprofessionals Patient consent forms recording patient/guardian consent to the treatment and costs associated with the services must also be kept for four years. Where can I find further information about Child Dental Benefits Schedule? What if I have not received a letter from the Government? You can contact Medicare and apply to be eligible. Until this is approved and reflected in the Medicare system, we cannot provide your child treatment under the scheme. We can still treat your child treatment but you will have to pay for treatment on the day and lodge a claim with Medicare directly. We have form available for you to complete and submit to Medicare for your claim. What if my application with Medicare is still being processed? Until your child’s status has been updated on the Medicare system, we cannot treat you under the scheme. We can still provide your child with treatment but you will have to pay for the treatment on the day and lodge a claim with Medicare directly. We have form available for you to complete and submit to Medicare for your claim.